This Bullet HD Network Camera from Sony provides the features of a much more expensive surveillance solution at a fraction of the cost -- and with renowned Sony Quality. 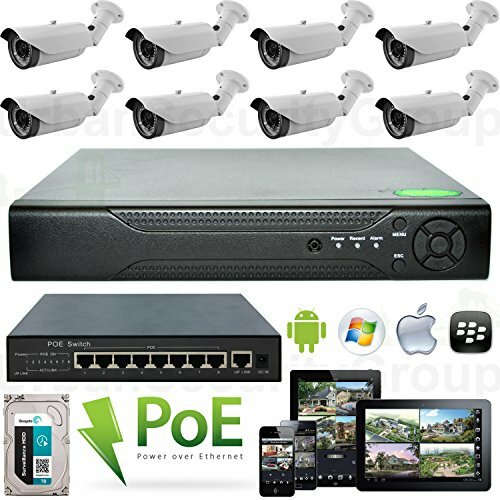 With full-color HD (1296 x 985 effective pixels) video and electrical day/night function, you're ensured high-quality monitoring no matter what. Keep an eye on your business or home with this compact IP security camera.Because your footage is transmitted over your network, you can view your video from any device with internet access, including your smartphone, PC, or tablet. Dual streaming capabilities avoid sapping your bandwidth while still offering 30 fps footage. 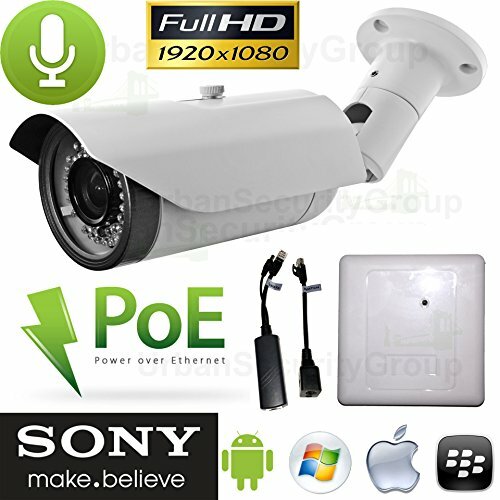 This Bullet Style IP Security Camera from Sony offers the finest in professional home and business surveillance, day or night. With high-definition 1080p resolution, XNDR (excellent dynamic noise reduction), and View-DR Technology (visibly enhanced wide dynamic range) you are guaranteed only the finest video quality in most any conditions. Its built-in IR illuminators enable night vision recording, even in total darkness. 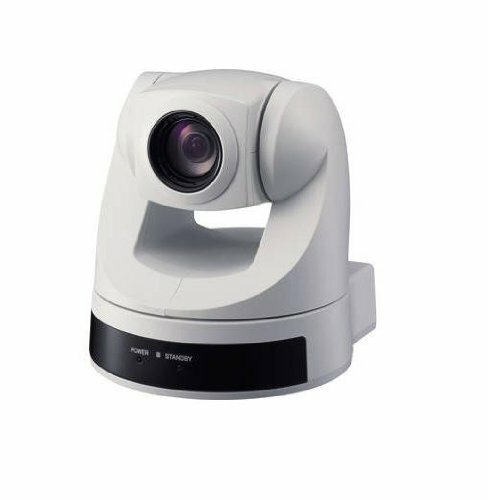 2x digital zoom and 2.9x optical zoom lets you focus in on a specific area of your footage for further detail.This network camera's durable vandal-proof housing protects against any tampering. Intelligent video features such as motion activation, tamper alarm, and audio detection, lets you record based on a number of user-defined rules. This camera also features PoE functionality, so you don't need a separate power source from the ethernet cable, freeing you up to install this camera almost anywhere. Two-way audio makes the IP camera great for monitoring home and office entrances. ***Shipped Directly From Our Factory! *** ***All Orders Arrive Within 1-3 Weeks After Payment! *** ***Eliminate Middlemen = Save Money! 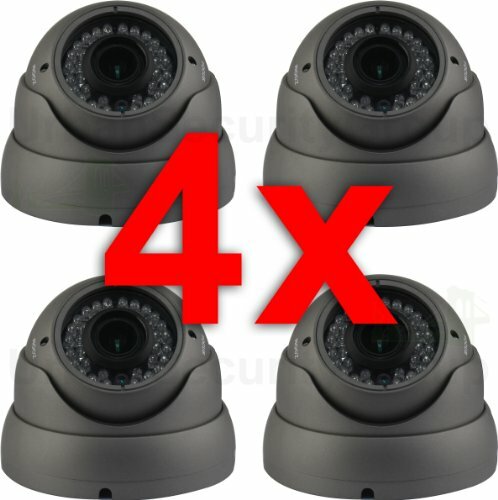 *** ***2 Year Warranty On This Product ONLY If Purchased From Urban Security Group Directly*** ***All Other Sellers Of This Item Are Offering Counterfeit, Non-Genuine, Refurbished Items*** Camera Model ADST30HD Product Listing Is For FOUR 4x Cameras! 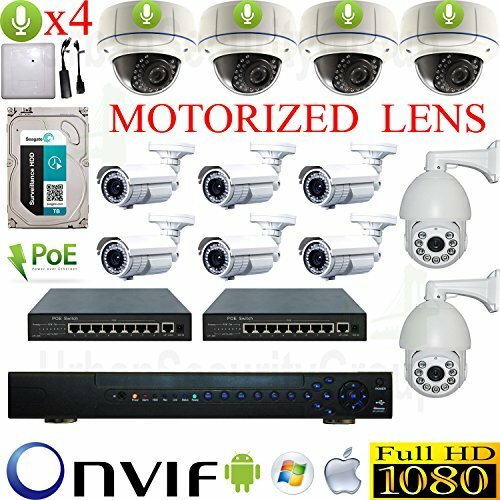 Professional High Definition Video Surveillance Security Camera! 1080p (1920x1080 pixels) = Same As DVD Movies! Easily & Clearly Identify Persons, Objects, Text and Small Details! 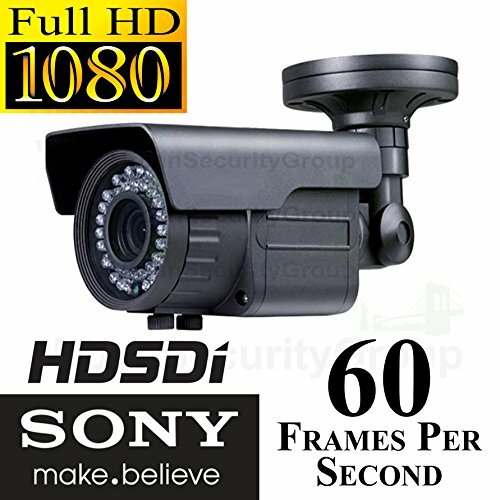 HD-SDI, hdCCTV, 1080p, 30 FPS, 2.1 Megapixel Sensor! 2.8 - 12.0 mm Varifocal Lense: Adjust & Fine Tune Zoom For Your Specific Needs Special Features: 1080p High Definition 2.1 Megapixels Varifocal Lens IR LEDs For Nighttime Protection Progressive Scan Wide Dynamic Range (WDR) On-Screen Display (OSD) Menu + Built-in Joystick Remote High Light Compensation (HLC) Digital Noise Reduction (DNR) Optical + Digital Zoom Adaptive Color & Contrast Enhancement (ACCE) Cable Through Bracket Wire Management Automatic White Balance (AWB) Back Light Compensation (BLC) Incredible Price! Incredible Value! Incredible Quality! BNC Connection HD-SDI capable DVR or Computer Capture Card must be used with this HD-SDI camera! 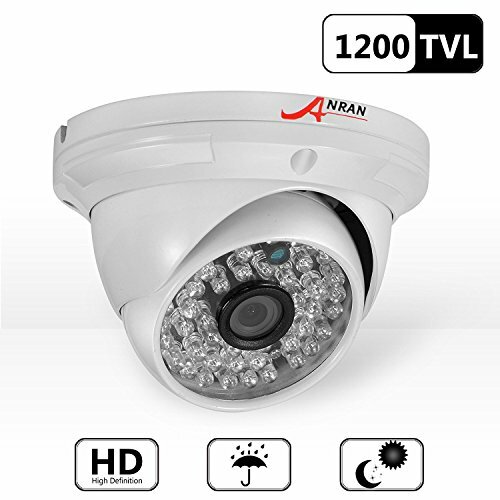 Protect your family, business and property with Urban Security Group's dome style IP66 weatherproof 1080p / 30fps / 1920x1080 pixels resolution 36 IR LEDs low illumination security camera. 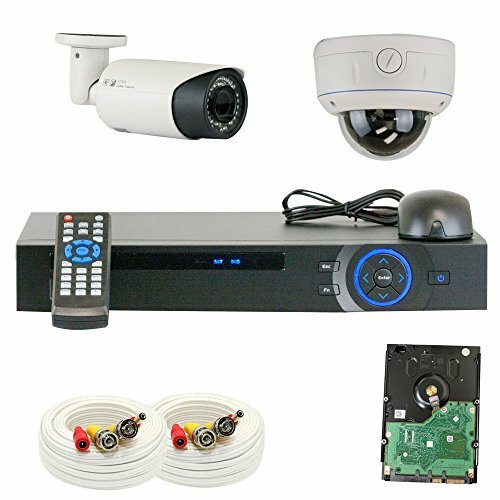 Package includes heavy duty mounting bracket View live video feed on your computer and mobile devices, including iPhone, iPad & Android, anywhere in the world with corresponding DVR. We stand behind the quality guarantee for this item! ***Shipped Directly From Our Factory! *** ***All Orders Arrive Within 2-3 Weeks After Payment! *** ***Eliminate Middlemen = Save Money! *** Whether upgrading an old or installing a new video surveillance system, Urban Security Group's business grade level HD-SDI security cameras are a tried, tested and proven top choice for retail consumers and professional CCTV installers alike! 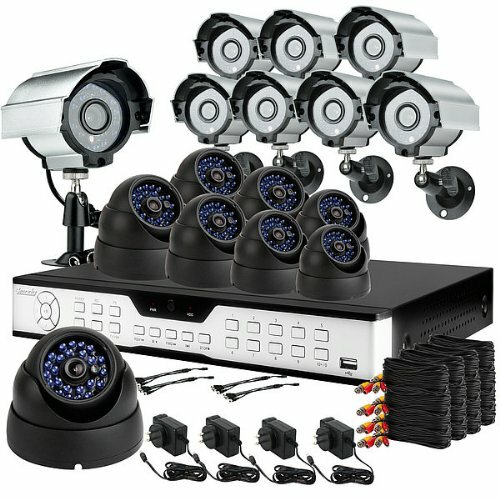 When purchased from seller 'Urban Security Group', you buy with confidence knowing: -Every Product Is Tested Prior Shipping -90 Day No-Questions-Asked Return Policy -3 Year Warranty -Lifetime AMERICAN Customer Support Camera Model LID40SNDHD Professional High Definition Video Surveillance Security Camera! 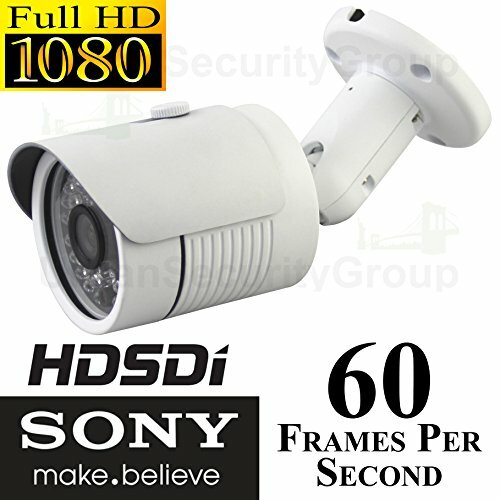 1/2.8" Sony HD CMOS Sensor Up To 60 Frames Per Second @ 720P / 30FPS @ 1080P (1920x1080) = Same As DVD Movies! Easily & Clearly Identify Persons, Objects, Text and Small Details! HD-SDI, hdCCTV, 1080p/720p, 30/60FPS, 2.1 Megapixel Sensor! 3MP 2.8 - 12.0 mm Manual Varifocal Lense: Adjust & Fine Tune Zoom For Your Specific Needs 42x IR LEDs For 130 Feet Of Nighttime Protection Special Features: Progressive Scan Wide Dynamic Range (WDR) High Light Compensation (HLC) Backlight Compensation (BLC) Digital Noise Reduction (DNR) Optical + Digital Zoom Adaptive Color & Contrast Enhancement (ACCE) Cable Through Bracket Wire Management Automatic White Balance (AWB) Automatic Gain Control (AGC) Motion Detection Defog + Sense Up Smart Noise Reduction Made In China Uses BNC & 1A 12V DC Connectors Amazon Search "Urban Security Group" For More Of Our Professional Grade CCTV Products! 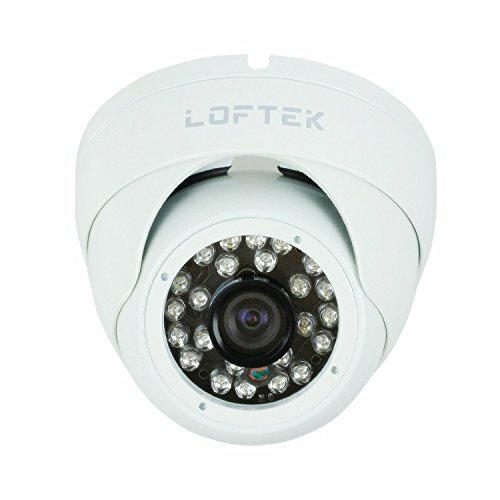 LOFTEK Conch-shaped dome 24 Infrared LEDs Day/Night Vision Security CCTV Camera Color CCD Video camera Sony Chip 420TVL(High Quality Chip, is equal to 800TVL), 3.6mm Wide View Angle Lens. built with high-quality metal housing . White. 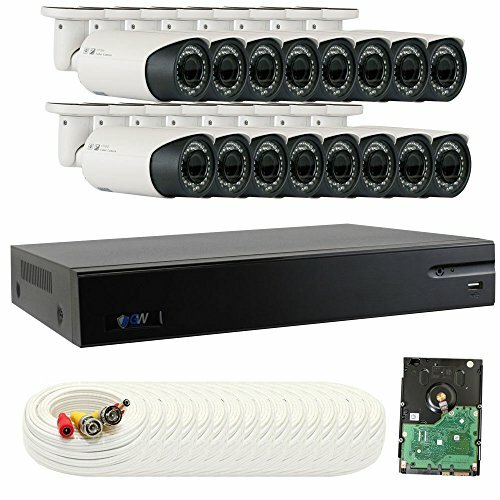 USG Sony High Definition 8 Camera 1080P PoE IP CCTV Kit: 1x 8 Channel NVR + 8x 1080P 2.8-12mm PoE IP Bullet Cameras + 1x 9 Port PoE Switch + 1x 3TB HDD Affordable High Definition CCTV Video Surveillance! ***Shipped Directly From Our Factory! *** ***All Orders Arrive Within 2-3 Weeks After Payment! *** ***Eliminate Middlemen = Save Money! *** Whether upgrading an old or installing a new video surveillance system, Urban Security Group's business grade level HD-SDI security cameras are a tried, tested and proven top choice for retail consumers and professional CCTV installers alike! 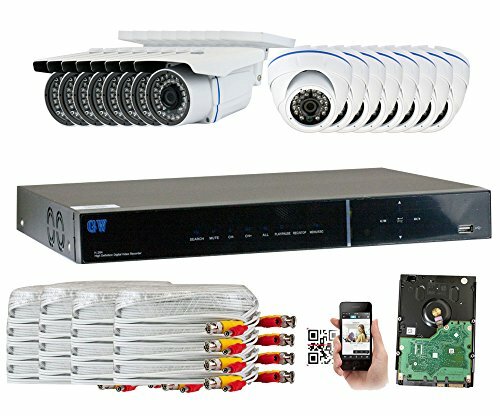 When purchased from seller 'Urban Security Group', you buy with confidence knowing: -Every Product Is Tested Prior To Shipment -90 Day No-Questions-Asked Refund Policy -2 Year USA Warranty and Lifetime Customer Support Camera Model LBH24SNDHD Professional HD-SDI Video Surveillance Security Camera! IP 66 NEMA 4x Rated Heavy Duty Mounting Bracket Included! Weather Aluminum Pro Grade Construction 1080P = 1920 x 1080 @ 60 Frames Per Second Easily and Clearly Identify Persons, Objects, Text and Small Details! 3.6mm Wide Angle Lens: One Camera Covers Entire Room Special Features: 1/2.8" Sony CMOS Sensor 60 Frames Per Second! 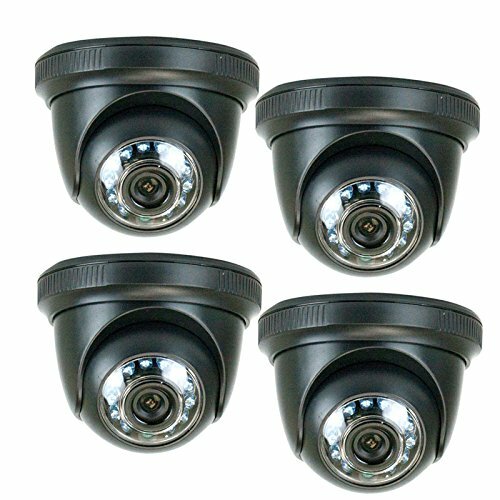 1080p 1920 x 1080 Video Resolution 3.6mm Wide Angle Lens 24x IR LEDs For Complete Protection In Low & No Light Environments HD-SDI Uncompressed Video Progressive Scan Auto IR Cut Filter, WDR, Defog, BLC, HLC, AWB, AGC, Smart 3D DNR, Digital Zoom, Motion Detection, Sense Up Must Be Used With An HD-SDI DVR Or Capture Card Camera Power Supply NOT Included Made In China Amazon Search "Urban Security Group" For More Of Our Professional Grade CCTV Products! 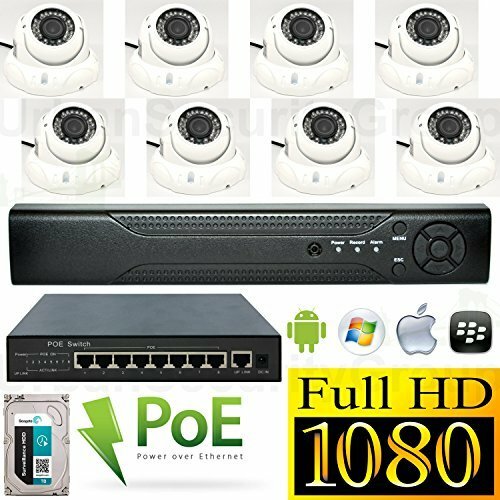 USG Sony High Definition Weatherproof EIGHT (8x) Camera 1080P PoE IP CCTV Kit: 1x 8 Channel NVR + 8x 1080P 2.8-12mm Vari-Focal PoE IP Dome Outdoor Cameras + 1x 9 Port PoE Switch + 1x 3TB HDD Affordable High Definition CCTV Video Surveillance! *** Shipped Direct From Our Factory = Eliminate Middlemen = Save Money! *** *** All Orders Arrive Within 1-3 Weeks After Payment! *** Whether upgrading an old, adding to an existing one, or installing a brand new video surveillance system, Urban Security Group's business grade level IP security cameras are a tried, tested and proven top choice for retail consumers and professional CCTV installers alike! When purchased from Amazon seller 'Urban Security Group', you buy with confidence knowing: -90 Day No-Questions-Asked Refund Policy -2 Year USA Warranty -Lifetime USA Customer Support Model USGDK7043SGPak2 Includes USGMicPoe02XL 30fps 1080P (1920 x 1080) High Definition: Easily & Clearly Identify Persons, Objects, Text and Small Details 2.8-12mm Varifocal 2MP Lens = View And Manually Zoom on Objects! 42x IR LEDs For 130 Feet Of Nighttime Protection Includes Audio Upgrade: RCA Audio-In+Out Jacks Transmit Video, Audio, Power For Camera, Power For Microphone Over ONE Network Cable! ONVIF Certified, WDR, Motion Detection , H.264 Compression Rated For Outdoor Use In Severe And Extreme Conditions HiSilicon HS3516C DSP + 1/2.5" Sony CMOS IMX 222 2.2MP HD Image Sensor = UPGRADED PREMIUM COMPONENTS! 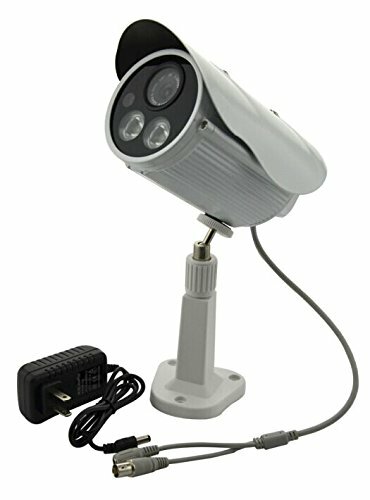 Minimum Illumination: 0.001Lux @(F1.2,AGC ON), 0 LUX with IR ON Easy Plug & Play Remote Viewing On Phones & Computers Camera Power Supply NOT Included Made In China Networking Knowledge Recommended! Software + Manuals CD: www.UrbanSecurityGroup.com/_storage_/USG_ST_EST_DK7_NVR_IPCam_miniCD_2015.zip We Recommend Our "STNVR6024D" http://www.amazon.com/dp/B00KMDVGO4 NVR For This Camera Amazon Search "Urban Security Group" For More Of Our Professional Grade CCTV Products!